WINTER 2018 7 E D I T O R ' S N O T E The DGA has one, so does the Costumers Guild. Film editors are celebrating the 17 th year of theirs. So what do these locals along with the WGA, the Art Directors' Guild and many more have in common? Magazines. 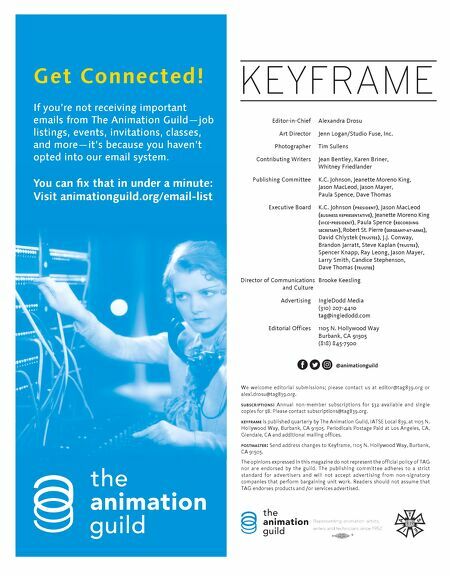 Each one has been celebrating the members and their craft through a publication for years so it's about time the Animation Guild gets its own. 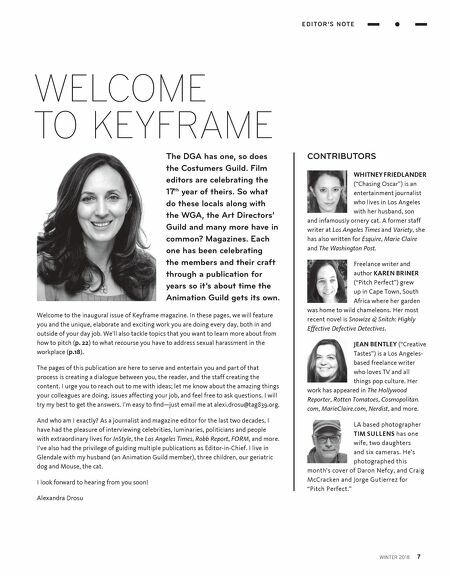 Welcome to the inaugural issue of Keyframe magazine. In these pages, we will feature you and the unique, elaborate and exciting work you are doing every day, both in and outside of your day job. We'll also tackle topics that you want to learn more about from how to pitch (p. 22) to what recourse you have to address sexual harassment in the workplace (p.18). The pages of this publication are here to serve and entertain you and part of that process is creating a dialogue between you, the reader, and the staff creating the content. I urge you to reach out to me with ideas; let me know about the amazing things your colleagues are doing, issues affecting your job, and feel free to ask questions. I will try my best to get the answers. I'm easy to find—just email me at alexi.drosu@tag839.org. And who am I exactly? As a journalist and magazine editor for the last two decades, I have had the pleasure of interviewing celebrities, luminaries, politicians and people with extraordinary lives for InStyle, the Los Angeles Times, Robb Report, FORM, and more. I've also had the privilege of guiding multiple publications as Editor-in-Chief. I live in Glendale with my husband (an Animation Guild member), three children, our geriatric dog and Mouse, the cat. I look forward to hearing from you soon! Alexandra Drosu WELCOME TO KEYFRAME CONTRIBUTORS WHITNEY FRIEDLANDER ("Chasing Oscar") is an entertainment journalist who lives in Los Angeles with her husband, son and infamously ornery cat. A former staff writer at Los Angeles Times and Variety, she has also written for Esquire, Marie Claire and The Washington Post. Freelance writer and author KAREN BRINER ("Pitch Perfect") grew up in Cape Town, South Africa where her garden was home to wild chameleons. Her most recent novel is Snowize & Snitch: Highly Effective Defective Detectives. JEAN BENTLEY ("Creative Tastes") is a Los Angeles- based freelance writer who loves TV and all things pop culture. Her work has appeared in The Hollywood Reporter, Rotten Tomatoes, Cosmopolitan. com, MarieClaire.com, Nerdist, and more. LA based photographer TIM SULLENS has one wife, two daughters and six cameras. He's photographed this month's cover of Daron Nefcy, and Craig McCracken and Jorge Gutierrez for "Pitch Perfect."